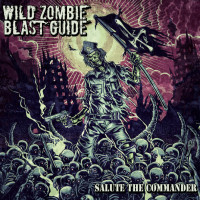 WILD ZOMBIE BLAST GUIDE is a German Thrash/Metalcore band formed a few years ago. After putting out a self-titled debut album, the band is now back with a follow-up: “Salute The Commander” (released at the end of January). Also, each member gave himself a nickname. Their proper names, shortened first as Frbs, Mrsh, Rli, Jrn and Twirst, became Z Boy, Reverend Z, Officer Z, Doctor Z and Z Machine. However, who plays what in the band, is a riddle as neither the press text nor the band’s website provide such information. Luckily there’s Facebook. “Salute The Commander” is my first acquaintance with this band. The album was produced and mixed by Z Boy (Mosh Bert?) at Black Rose Studios, while the mastering was taken care of by POWERWOLF guitarist Matthew Greywolf. It starts with the title track’s Metalcore riffing in the building intro. Then all power is unleashed, including the typical screaming vocals. However, the music does sound catchy. The chorus is a pounder, pushed onwards by an electronic beat. Sort of like e.g. NIGHTWISH’s “Wish I Had An Angel” (“Once”, 2004). Can I say “yuk!”? Sorry, I’m not such a fan of electronic music, at least not the beat version. After this the Metal becomes very energetic and gets blasted out of the speakers, to return to the chorus and into a rather chaotic solo moment. The whole mill does a rerun, arriving at a bridge leading into a depth of silence. All ends with the main riff, be it in a cleaner fashion. All in all, an ok song. “This Is Hell” starts clean, followed unexpectedly by Metalcore-driven aggression. The music’s vile, fast and energetic! Or, Thrashy with occasional blastbeats. Breakdown-influenced parts are the bridge and chorus, presenting itself as an attack on the mind. A clean interlude halfway breaks the song in two, where the second half begins with a solo and slow/midtempo backing. The furious Thrashcore returns to take it all to the finish. Like the previous song, quite entertaining, but nothing super. Honesty obliges me to indicate “Under Toxic Skies” as a highlight. One of the few, by the way. The music kicks in instantly, attacking directly like a round of fire. This is followed by fast, uptempo raging tunes. Again, catchy, but also encouraging you to not resist the urge to move (headbang, tap with your foot, ….). Melody comes out in the bridge, with its clean vocals and electronic sounds. This connects with the straight-forward chorus before returning to the aggressive verses. The bridge set after this may be slower than before, it isn’t less vile. And so the chorus also comes into play again. Another highlight is “Thrash It Or Trash It”, which fades in slowly, then unleashing its powers. Fast Metal, though with a touch of melody. The verses are fast, have melodic backing (for the sake of atmosphere), and connect with a fast bridge that leads to the pounding, thundering chorus. Again melody is of importance, not only through the vocals (here: cleans and screams). A little later it’s time to activate the Thrash button, during which lots of headbanging can be done, when one feels the need to do so. The blastbeats help to spice things up a little. Somehow, in general, the chorus reminded me of the German Thrash veterans TANKARD. “Mission Complete” starts slow, but then it’s pedal to the metal with screams, sharp riffing and pounding drums. Electronic samples are the extra spices. But then contrast strikes: slowdown and time to play that obligatory solo. But is that an organ in the back? Why? Moving on to the Pop/Dance samples of “Damnation”, we’re back in the 1990s, the early years. Metal is added, reminiscent somehow of KORN (? ), but Metalcore is not far away, especially the screams. The tempo increase, the whole becomes more voluminous, and the screams persist. However, things change later and that’s a positive moment here. Another slow start, yet massive and bombastic, is “Birds Of Prey”. Uptempo Metalcore is unleashed soon enough. The vocal department is this time occupied by screams and growls. The music has a more Southern feel with wild leads in the chorus. Not really my cup of tea, musically. The chorus sounds pretty Poppy, but in a Metalcore jacket. Some time later a drum break comes in with subdued screams, leading back to the chorus. No time to rest as the incoming attack of “End Of Your Rope” is very near. As you can expect, the song is relentless, furious and more of such happy adjectives. For all you mental people, the ADHD is out there. The song is repeated as track 11, this time with the inclusion of trumpets for a happier approach. Also pounding wildly and with fury is “You’ve Died Before”, which contains electronic elements and Country influence (is that a banjo? ), if I’m not mistaken. There’s, near the end, even room for a duet: clean vocals and screams. Sounds rather messy, in my opinion. “UTZA” begins calm, grows gradually in volume and power. It’s not as wild or energetic as before, sounds more like a Metalcore hymn, in a manner of speaking. It ends like it started. You could also consider it the ugly duckling on this album, as it just doesn’t sound/feel right, musically. WILD ZOMBIE BLAST GUIDE indeed does what the name says: blasting its way onwards. From start to finish the material is about energy, fury, and anything else along these lines. Here and there the band made some nice compositions and twists, but overall it’s not the kind of album to sit through in one listen, rather mix the songs with others in the playlist. Unless this kind of Thrash/Metalcore is your cup of tea. Music remains a personal preference, but overall I can’t consider “Salute The Commander” a recommended release. It’s good for in between, to change your habitual playlist, but nothing more.